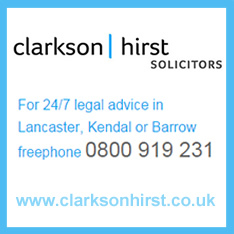 Clarkson Hirst have sponsored Lancaster and Morecambe Hockey Club for several years. Hockey and cycling are both personal interests of the Director, though in the case of cycling he is also aware of the risks of using a bike - especially for youngsters. Though not much of Clarkson Hirst’s business is directly related to cycling, they have dealt with many personal injury cases including cycle accidents. Of course, they hope you will not need to make use of their services for this but in the unfortunate event of a cycling accident occurring they can assist on a no win no fee basis. If you do need that kind of help - or if you’re thinking of taking local, professional advice on any of the usual range of legal matters - clicking on their logo at the bottom of our homepage will take you to their website.